As we get older, getting into and out of the bath becomes more difficult and more dangerous. 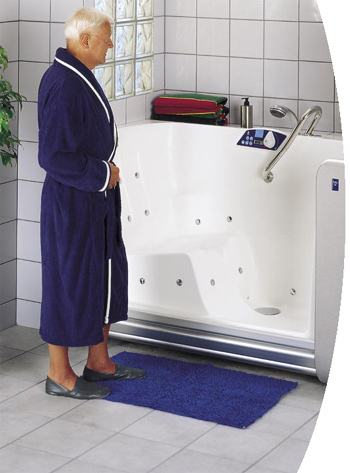 The high rim height of a standard bath tub becomes an increasingly risky obstacle for the elderly to overcome. Eventually, it can prevent access to residents who could otherwise bathe unattended. The Freedom Bath allows the ?exibility for your residents to “age in place”. Freedom Bath offers a revolutionary solution with its unique Roll-Door. The Roll-Door glides out of sight beneath the bath, saving space and leaving the side of the tub clear for safe and easy entry or exit. Freedom Bath opens the door to true independent bathing both for ambulatory residents as well as residents who need assistance to get into the tub. All controls can be positioned for convenient operation by either the resident or caregiver. Freedom Bath can also be positioned in numerous ways within the room. The Freedom Bath can be installed in a freestanding position, which is ideal for assisted bathing, allowing the caregiver access to the resident from three sides. For unassisted bathing, it can be recessed into a standard bathtub opening. Bathing comfort is built-in, allowing residents to relax on the semi-reclined seat and enjoy a refreshing shower, a soothing full immersion bath or a relaxing whirlpool or air spa. The built-in mixer for filling and showering makes the bath very easy to install – you simply connect the unit to the power, the mains water supply and drainage.